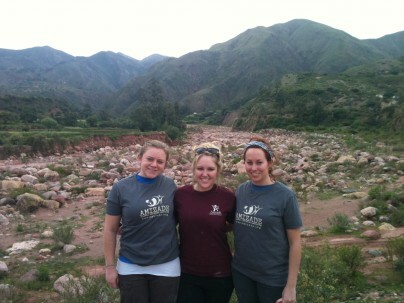 This winter, three Amizade interns took part in Amizade’s Winter Break course in Bolivia. Here are their thoughts. Mallcorancho Community Center…how can I describe this place to you? So many words come to mind (none of which I knew before arriving) so I will try to narrow it down to hermoso, feliz, bondadoso, generoso, amoroso, y brillante…beautiful, happy, kind, generous, loving and brilliant. Of course we didn’t know any of this at first, though. As I sat in a room full of strangers ranging from 8 months to 80 years old, I had wished so badly that I could say more to them than just, “Hola” and “Si.” If only I could open my mouth and the words would just come out, “Yo no estoy aquí para entrometer, sólo para asistir.” “I am not here to interfere, only to help,” but the next few days showed me just how much this was already understood. The smiles on their faces are what sticks with me. What I think about every time I close my eyes and try to remember the experience. How we couldn’t go without five minutes without sharing a laugh with our supervisor Crisanzio about something funny we were doing… making a mess of our cemented walls, trying to properly pronounce each other’s names, dancing or spouting off improperly conjugated verbs. Who cared if I wasn’t right? I was trying hard and genuinely caring about this community. So why did we both have to speak Spanish or English to understand each other? We didn’t. We didn’t have to be the same age, ethnicity or gender. We didn’t have to have the same background, upbringing, culture, or even speak the same language to become life-long friends….and that (is what I tell everyone that asks) was my favorite part about my trip to Bolivia. A brochure fell out of my notebook today. When I went to pick it up I remembered that the notebook that was always under my arm in Bolivia is now the notebook I use for my Swahili class. It’s weird to think that I kicked off 2012 in the Southern hemisphere, and now a few weeks later it’s back to business as usual–almost. Back to that brochure. It’s looking a bit rough at this point, but the words Fundacion Ninos Con Valor are still emblazoned across the front. Inside are pictures of the inspirational children and teenagers that have found solace and support at Corazon del Pastor: a home for girls and adolescents. I was lucky enough to spend New Years day with them; just playing, talking, mini-bowling (their favorite Christmas gift), and sharing a snack with them. The younger kids were shy at first, but soon they were following us around, donning our sunglasses, and sharing their galletas with us. We walked through their home, asked questions, and discussed the founders’ plans to make it a more sustainable place in the coming year. Merely 3 weeks later I was given the task to sort through some photos from the group that went to Bolivia immediately after mine. I opened the email and saw all the faces that are still so clear in my head. All the girls were there painting their nails, playing board games, and most importantly planting a hanging wall garden of vegetables with the new Amizade volunteers from Plymouth State. It was a solid reminder to hop on my new years resolutions, and it only further reinforced my faith in Amizade’s efforts and commitment. As I look through my pictures I am immediately transported back to the picturesque countryside. I can see my group members cementing walls in Mallco Rancho, chatting over choclo and writing during our class sessions. Our time in Bolivia flew by, everyday surpassed the first with beautiful sites and new experiences every waking minute. As our trip came to a close, our group did not imagine the trip could become any more remarkable… and then we took a trip to Copacabana. We spent the day walking through the town and reflecting on the past two weeks. The next morning we piled onto a boat and begun our journey to Isla del Sol. We spent the day hiking around the island and listening to our flute-playing guide as he rattled off facts and history notes. For lunch we sat at table, overlooking Lake Titicaca and feasted on fresh trout, chicken, beef, eggs, cheese, corn, potatoes, and faba beans. After pictures, we shared words of thanks, climbed back onto our boat, and began our trip home. As we traveled back to the shore we sat in comfortable silence, enjoying the beautiful scenery; our boat pulled into the dock and reality started to set in – our journey back to the states would be starting the next day. With a final picture and a wave, we parted ways with Copacabana, and even though we left Isla del Sol behind us, we all knew we would be taking this little piece of world back with us. Amizade has given me the most precious gift, the gift of understanding and motivation, passion and friendship. My trip in Bolivia has been tattooed on my heart, it has solidify my career goals, shown me the importance of being a global citizen who acts and strives towards change and granted me the gift of friendship.